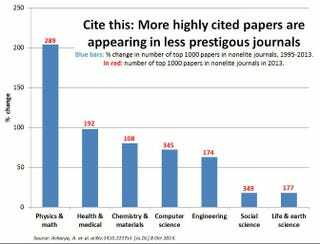 A small group of elite science journals get the lion's share of citations and media attention, but that dominance is eroding as it becomes easier for scientists to find obscure but relevant papers. In 1995, only 27% of citations pointed to articles published in non-elite journals. That portion grew to 47% by 2013.